Presently: Professor, Head & Group Coordinator, , Pulmonary Medicine,– Kerala Institute of Medical Sciences, Trivandrum. There are 10 Residents currently undergoing training in Pulmonary Medicine in KIMS. 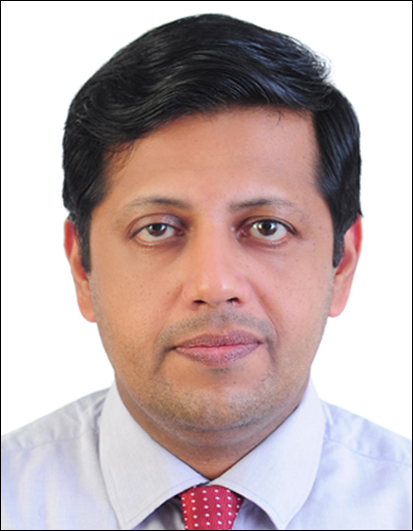 Previous experience: Associate Professor of Respiratory Medicine, Dr. SMCSI Medical College, Trivandrum (2005-2010) Achievements – was Member of the international asthma guidelines review panel for the updated GINA workshop guidelines on management of asthma – WHO/NHLBI.USA Advanced training	:Trained under Prof.Richard Beasley in the Asia Asthma Academy, Christchurch, New Zealand Trained under Prof.Collin Sullivan, University of Sydney – in Sleep Medicine Trained under Prof. Philip Asthoule, Marseilles, France in Interventional Pulmonology Areas of interest	: Asthma, COPD, Sleep Medicine & Interventional Pulmonology. Academic and research experience: •	DNB examiner in Respiratory Diseases •	Has been a guide for 5 Post graduate trainees in DNB Respiratory Medicine and co-guide for 13 Post graduate DNB trainees in Respiratory Medicine, Internal Medicine, Paediatrics and Radio Diagnosis). •	Was actively involved in teaching of under graduate students till 2010. •	Has been actively involved in training Post graduate trainees in DNB Respiratory Diseases and Internal Medicine from 2010 onwards.